The World Championship finals of the most popular eSport has its first ever Welsh competitor. Barney Morris, who goes by the name 'Alphari', is the first Welshman to compete at a League of Legends finals. After progressing through the group stages, the south Wales gamer and his team Misfits have made it to the last eight. 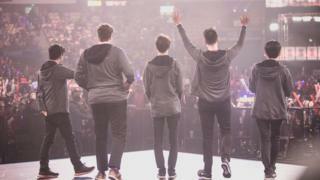 Friday's quarter-final however will be Misfits' biggest test yet, as they take on reigning champions SKT Telecom T1. League of Legends is one of the most competitive eSports in the world, with 27 million players each day. The World Championship, the most lucrative eSports tournament in the world, sees the best 16 teams from the past year compete to be crowned champions. Last year's final was watched by more than 43 million people, with finalists SKT Telecom T1 and Samsung Galaxy both taking home over $1m (£755,000). The concept of the game is to destroy the opposition's base, known in-game as 'The Nexus', before the opponents can destroy your own. Released by Riot Games in 2009, each player controls their own individual character, choosing from 138 different types, each with different abilities and playing styles. But players must work together if they are to win, with those performing the best getting in-game advantages over their opponents. The first team to capitalise on their lead, or take advantage of their opponent's mistakes, and successfully destroy the other's nexus, wins the game. Most games finish there, but at a World Championship all games after the group stages are 'best-of-five' match-ups. Not only is Alphari the first Welsh League of Legends player to reach a World Championship, he is also the first to win a game at the tournament and the first to progress past the group stages. The 18-year-old, who went to school in Cardiff, helped his European side Misfits Gaming see off their Group D rivals to book a place in the quarter finals of the competition. Alphari said he was enjoying his first experience of a World Championship but was not aware he was the first Welshman to compete. He said: "There's a lot of camaraderie between each region's teams. We all stay in the same hotel and are in different groups so we get to cheer for each other. "Honestly, becoming the first Welsh player was not something I had ever thought about until some casters tagged me on Twitter saying I was the first Welshman to win at Worlds." The only other British player at this year's competition also plays for Misfits, Nubar 'Maxlore' Sarafian, and the two are the first British players to compete at a World Championship since Raymond "kaSing" Tsang in 2015. Together they helped guide Misfits past Team SoloMid and Flash Wolves, but the real test is still to come. Misfits have been drawn against reigning champions and pre-tournament favourites SKT Telecom T1 in the quarter finals. Every team to have competed in a World Championship final since 2013 has been comprised entirely of players from Hong Kong, China or South Korean and every finalist since 2015 has been South Korean. Alphari said he and his team knew they would have to beat one of the tournament's Korean teams if they were to win but added that "anything is possible". He said: "Even though we're the massive underdogs, they have looked more beatable this year than in others, so that's a silver lining, but win or lose it is going to be invaluable to get to play against them." For Alphari, Friday is not just quarter-final day, but it is also his birthday, and victory would be an "insane present" for him. If Misfits find a way past SKT Telecom T1 on Friday, Alphari and Maxlore will become only the second and third British players to reach a semi final. Great Britain has been poorly represented at every single League of Legends World Championships despite having a huge fan base. Alphari believes the ego of British players negatively impacts their play, and says players focus too much on winning rather than improving. He said: "It's really important to acknowledge your mistakes after a game to learn from them and improve. "Even if you outperformed your enemy counterpart you should never be satisfied until your play is perfect - which is basically never."